Maddy Jenkins swings at a pitch for Washington during a Frontier Athletic Conference game against Jackson at Washington High School Friday, March 29, 2019. 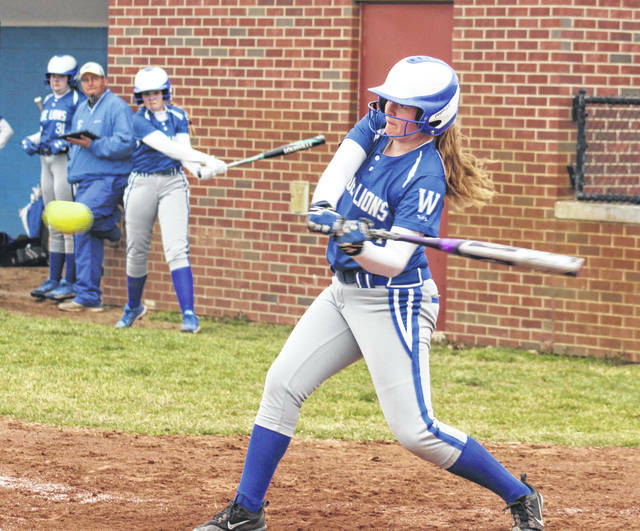 The Washington Lady Blue Lion softball team had their 2019 home-opening game Friday night against the defending Frontier Athletic Conference champions Jackson Ironladies. Jackson won the game, 9-0. The visitors scored four runs in the third, four in the fourth and one in the fifth. Jackson had 12 hits and committed no errors. Washington had two hits and three errors. T. Evans was the winning pitcher for Jackson. She pitched seven innings, with two hits, 14 strikeouts and two walks. Makenna Knisley started and took the loss for Washington. She pitched five innings with 10 hits and nine runs (seven earned) with five strikeouts and two walks. Brooklyn Devenport pitched the final two innings for Washington with no runs, two hits, two strikeouts and no walks. Devenport had one basehit and Meredith Pabst had one hit for Washington. K. Newkirk and Evans both had three hits each to lead Jackson. K. Bako had two hits. Conditions were overcast with temperatures in the 50’s and no rain. Washington (0-2 overall, 0-1 FAC) is back in action hosting a tri-match Saturday with Adena and Circleville starting at 11 a.m.
Washington is at home Monday to take on Eastern Brown at 5 p.m.
Offensively for Washington: Kassidy Olsson, 0-3; Brooklyn Devenport, 1-3; Maddy Jenkins, 0-3, fc; Makenna Knisley, 0-3; Meredith Pabst, 1-3; Corynn Chrisman, 0-2, 1 bb; Taylor Smith, 0-3; Haven McGraw, 0-2; Brooklyn Foose, 0-1. LOB: 4. Offensively for Jackson: S. Humphreys, 1-5, 1 run, 2 rbi, 1 2b; L. Alford, 1-4, 2 runs, 1 2b, roe; K. Bako, 2-4, 1 run, 1 rbi, roe; A. Helman, 0-0, 1 run; K. Newkirk, 3-4, 1 run, 1 rbi, 1 2b; T. Evans, 3-4, 2 rbi; M. Humphreys, 0-4; M. Baxter, 0-3, 1 run, 1 bb, fc; K. Kight, 1-3, 1 run, 1 bb, 1 2b; H. Fox, 0-0; G. Webb, 1-3, 1 run, 1 2b, 1 sac; J. Bond, 0-0. LOB: 7.